I’ve been extremely fortunate to spend the last twenty+ years studying authentic Ninjutsu under Mark Davis at the Boston Martial Arts Center in Allston, MA. The journey of studying and learning with him continues to this day. It’s amazing to me that so much time has passed since I first started training. My own journey into martial arts started because of problems I had dealing with bullies as a young boy. When I was in my early teens, I started hearing about these amazing guys called “ninja” and how they could disappear in puffs of smoke, decimate enemies with the touch of a finger, and bend the universe to their will. For someone who was dealing with hulking beligerent slobs on a daily basis, that sounded like a pretty good antidote. 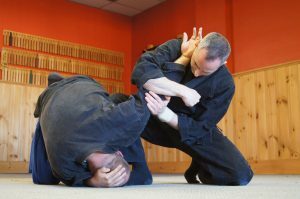 But ninjutsu at the time was only being taught in places like Japan and a few places in the US that were far away from Massachusetts. So I settled for Tae Kwon Do and a variety of other arts (Karate, Kung Fu, Judo, and some Aikido) knowing that I would eventually find a qualified teacher to study ninjutsu with. 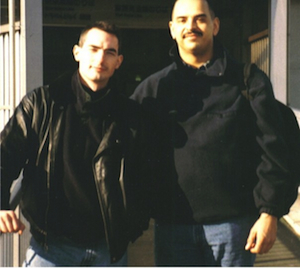 Mark & I outside of a train station during a training trip to Japan in 1997. Around 1990, I found that teacher. Flipping through a copy of Black Belt magazine, I saw a ninjutsu technique pictorial with a guy named Mark Davis in it. At the end of the article, there was a mailing address…and the postal code was in my own neighborhood! I was stunned. There were people training in this mysterious art in my own backyard and I didn’t even know it. It was too good to be true. I sat down and crafted a heartfelt and sincere letter to Mark and sent it off. He called a few days later with a time and location. I dragged an old friend along (sadly, he didn’t stick with the art) and we arrived at a decrepit triple-decker in Jamaica Plain, Massachusetts on a warm Spring evening. The triple-decker housed a Uechi-ryu Karate studio on the top floor. Mark rented space from the bizarre teacher. My heart was thundering in my chest at the thought that I was finally about to start training in this ancient art. Upstairs , it was sweltering. Mark came in, relaxed and nice and informal. He was a lot bigger in person than the magazine made him out to be. (He played college football for Northeastern University). Everyone was pretty laid back, although they were a bit reserved toward me. It was a very small, tight-knit group of practitioners. They had no formal dojo; they rented space and trained in parks all over town (including the park at the end of my street). Mark showed a technique and then suggested I train with a guy named Paul. I looked up at Paul and he seemed at least eight feet tall. He had a dour look on his face, spoke with a British accent, and looked mildly annoyed that he’d been stuck with the “new guy.” But all that seemed to evaporate over the course of that first lesson (and Paul grew to be and remains one of my closest, most-trusted friends). This was the art I’d been searching for. Practical, economical movements that wasted nothing. Muscle meant little in favor of properly applied total body weight in motion. We twisted, punched, kicked, and rolled all over the back-breaking polished hardwood floor for nearly two hours. At the end, I was exhausted, bruised, drenched in sweat…and utterly ecstatic. Paul, Mark, and I goofing around after a magazine photo shoot. In the nearly 30 years since I started studying martial arts, I’ve been extremely fortunate to have trained with an amazing array of teachers. Both here in the US and abroad in Japan, my training and journey along the path that started long ago never fails to challenge, excite and inspire. I owe a tremendous debt of gratitude to the people who have been kind enough to share their wisdom, insight, knowledge and experience with me. Ninjutsu has saved my life on numerous occasions. For me, that’s a pretty powerful endorsement. Barry, Paul, and I under the kamiza in April, 2013. I’ve been honored to teach defensive tactics to a variety of organizations including the US Department of Justice, Bureau of Prisons, community crime watch groups, kids, women’s self-defense courses, and a variety of military and government groups. These days, I run my own training group, which gets together on occasional Sunday evenings when my schedule permits it. 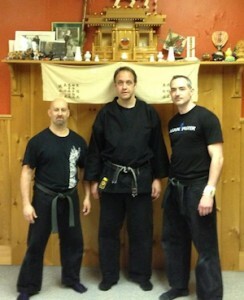 Most Fridays will find me training in Boston at Mark’s advanced black belt class with my closest friends. Every class is a continual reminder of how much more there is to learn, how much more fun there is to have, and how incredible the adventure continues to be…decades after it began. 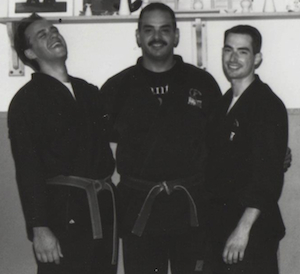 On February 16, 2003, I was honored to be the 1800th person in the world to undergo and pass the 5th degree black belt test in the Bujinkan Ninjutsu tradition. The test is quick and decisive. You pass or you do not. Here’s the video of me taking the test. 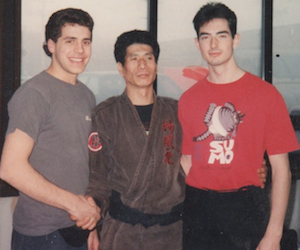 Needless to say, I happen to think my teacher Mark is one the most incredible martial arts teachers alive today – truly a once-in-a-generation personality – and can’t recommend his school enough. 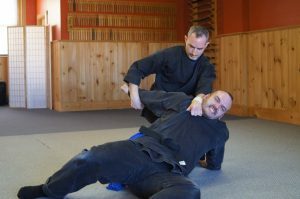 If you’ve ever been interested in practical, pragmatic martial arts that are as relevant today as they were thousands of years ago, you should call Mark and come try a class. (617) 789-5524. You don’t need to be an experienced martial artist. All you need is a willingness to come and try it out. Remember: Who Dares Lives. So give it a try. It will be one of the coolest things you’ve ever done! Who knows? Maybe I’ll see you around the dojo!